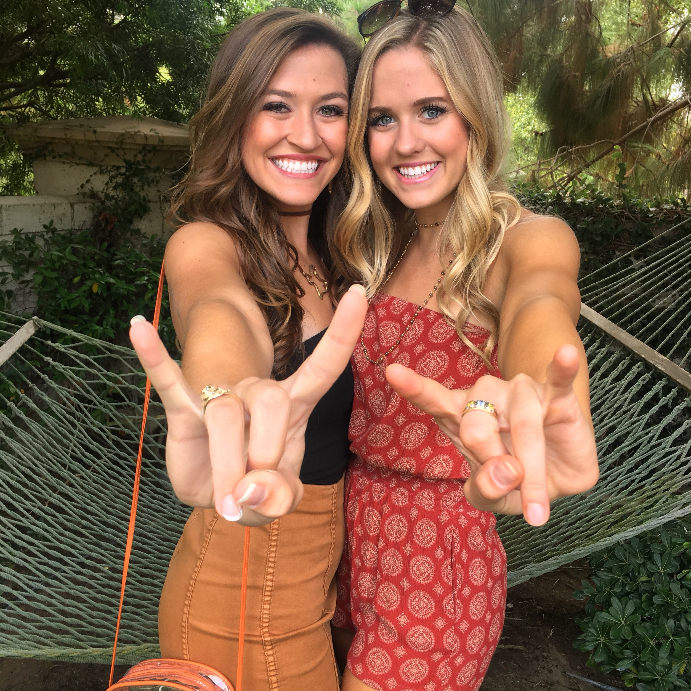 Theta Zeta chapter of Delta Delta Delta was founded in November of 1912 at the prestigious University of Texas at Austin and has since fostered sisterhood, leadership, and strength of character among its members. 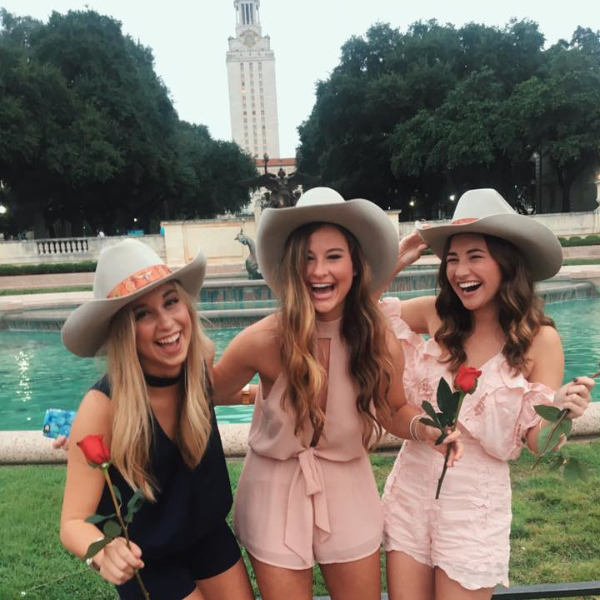 Texas Tri Deltas not only uphold our organization's ultimate purpose, but we also strive to be the most genuine and sincere women on the UT Austin campus. 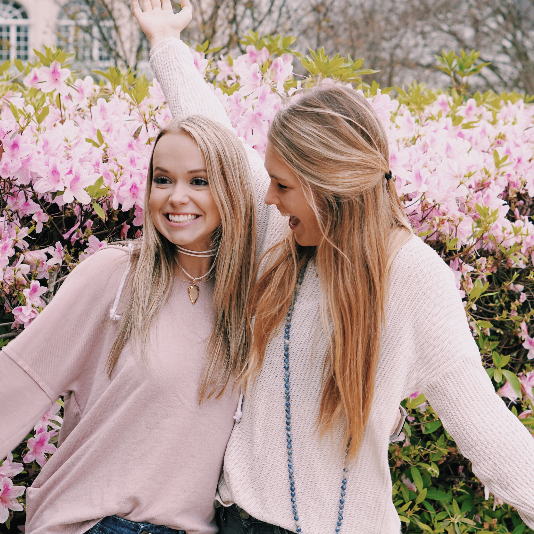 Our chapter stands out from others because of sisters who lead both in and out of the classroom, devote themselves passionately to our philanthropy, St. Jude Children’s Research Hospital, and develop a meaningful sisterhood. 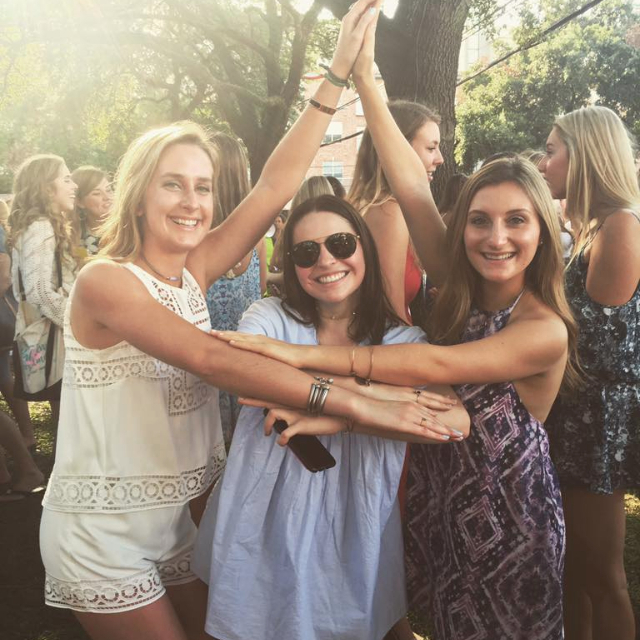 Texas Tri Delta has lived out our motto to "steadfastly love one another" for over 100 years! Over the summer, Tri Delta sisters worked in various jobs and internships, studied abroad, or soaked up the warm summer sun. On August 14, 2017 all members were back in Austin, Texas for the start of workweek. 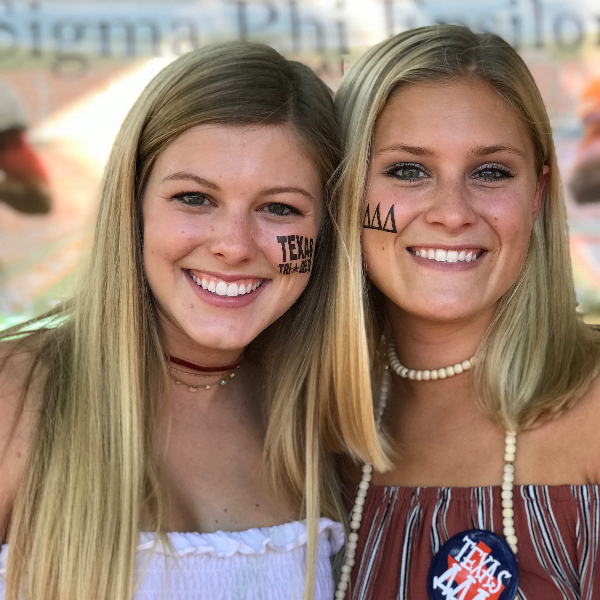 During workweek, the halls of the Tri Delta house rang with door chants and laughs as each Theta Zeta member prepared for potential new members. At the end of a long week, the lovely rush team gave the chapter a day off to watch a movie together as a time to bond, relax, and prepare for an exciting week ahead. On August 21th, University Panhellenic Council Recruitment Week had begun. The first day, over 1,200 potential new members had visited the Tri Delta house, or the “Delta Shelta”. We received many compliments from girls going through recruitment for having refreshing, genuine conversations with current chapter members. The following two philanthropy days consisted of facts, fun, and passionate talks about St. Jude. The next night was out first ever "Sisterhood Night" with the theme Date with a Delta. On this night, potential new members got the chance to see the personality of our chapter, make smores together, and hear funny and sentimental letters from girls in our chapter. Recruitment progressed smoothly, and by preference night, we had over 100 girls in mind as new members. While PNMs casted their votes, Tri Deltas celebrated the end of a long week with a dance party. On bid day, we graciously accepted 71 new girls, which was well over quota. The chapter joyously welcomed our new members with hugs, tridents, posters, and pictures with the UT mascot! The following Wednesday, August 30th, classes began. New members began attending new member meetings, and “Pansy Pal” activities, which are planned outings for new members and actives to get to know one another. Pansy pal meetings consisted of activities such as cookie decorating and going to Sno Beach, in hopes of finding their future Big. A couple short weeks later, the week of Big/Little reveal finally arrived. During this week, new members anxiously awaited finding out their sponsor and received one anonymous gift during the week from their future big with a note about how excited they were for the Big/Little Reveal. On the day of Big/Little Reveal, the bigs placed matching costumes on chairs in the Chapter Room of the Delta Delta Delta house for their littles. The bigs hid in the basement while the littles changed into their costumes and then went outside to the front of the house. Then the bigs ran outside and found their littles with many pictures taking place. The next Friday we had out first date jioned date event with Zeta Tau Alpha that was Casino themed! The following week had the first chapter meeting on September 11th and the start of Mexican Lunch on Wednesday afternoons. In the last year, 8,400 people came to the House for mexi lunch to enjoy company of good friends, fajitas, and warm queso. On September 24th there was a chapter retreat where a member of Pledge Class 2017 led us in some yoga and we ate Blenders and Bowls. Yum! The annual Texas/OU Weekend took place on October 13th through October 15th. Chapter members traveled to Dallas, Texas with various friends and fraternities for the famous rivalry at the Cotton Bowl at the Texas State Fair. 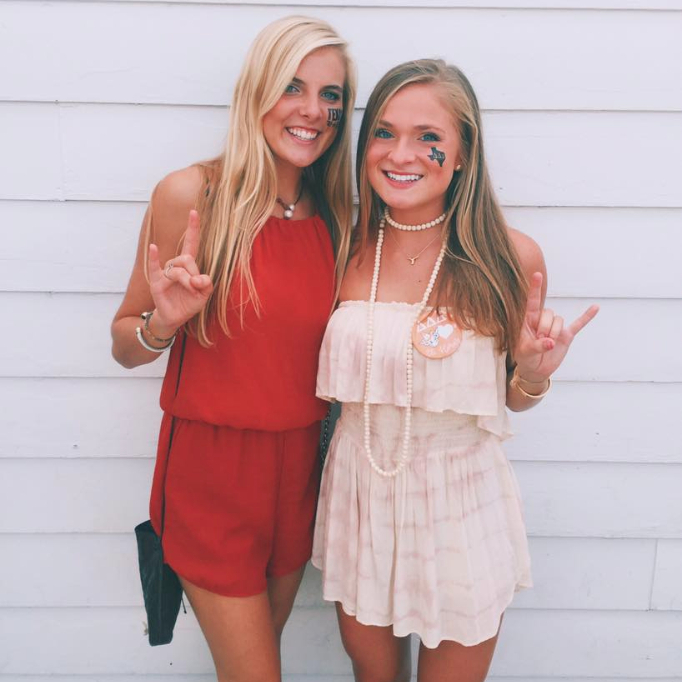 Although it was a close game, the Longhorns lost to the Sooners with a score of 29 to 24.The next week entailed the beginning of Delta Week, where the new members spent a few hours with each pledge class and did various activities such as cookie decorating with PC ‘14, yoga at the house with PC ‘15, and karaoke PC ‘16. Delta week concluded with the traditional Stars and Crescents Degree on Friday and the Trident Degree/Initiation the next day. The new members received monogrammed blankets from their new member educators. After initiation, parents, alumni, and newly active Tri Delta sisters all celebrated together over brunch. Shortly after, girls living in the Tri Delta house decorated the doors and hallways in preparation for the Halloween Carnival. At the carnival were face paint stations, sugar cookie decorating stations, coloring stations, and actives holding bags of candy down every hallway. Children of alumnae came into the Halloween carnival with an empty candy bag, and left with smiles and full stomachs. October was a busy month! The month of November included Tri Delta Parent's weekend and the second annual St. Jude Silent Auction, which took place on November 10th at The Goodnight. The silent auction was a complete success, raising over $68,000 for St. Jude! It was a great time for bonding, good food, and a great cause with Tri Delta sisters and their families. The next day, deltas enjoyed a tail gate and good food at the Delta Delta Delta house with family before the Kansas game. Shortly after, slating took place on the 14th, and new officer reveal took place on the 17th. 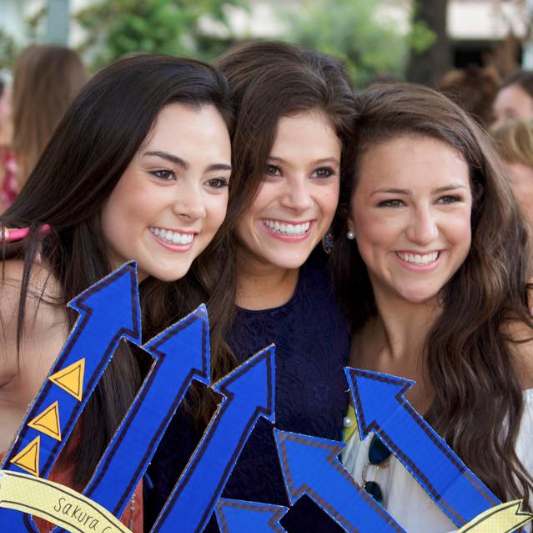 Founder’s Day took place on November 19th, as Tri Deltas nationwide celebrated 129 years of sisterhood. Leadership of Theta Zeta brought back “Delta Mom’s”, where each freshman was paired with an alumni at Founder’s Day. New relationships, lighting of candles, and brunch at this event marked the end of November as girls traveled home for Thanksgiving break. 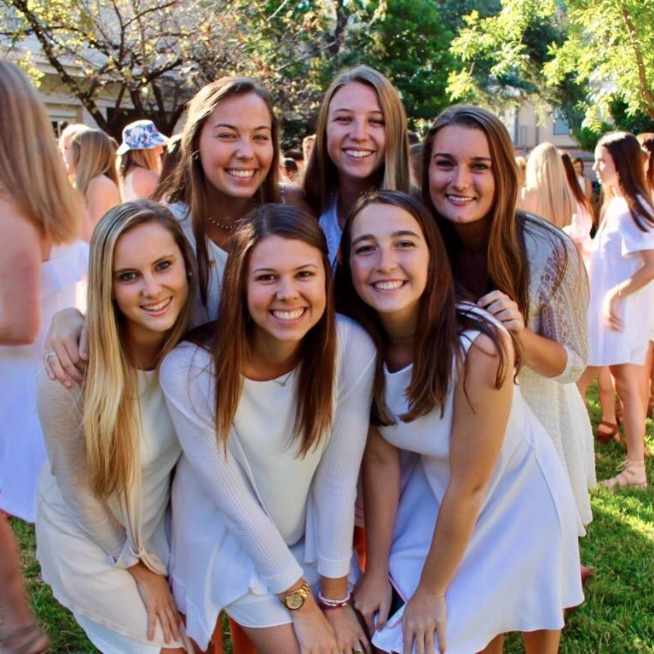 Once sisters were back in Austin, the Tri Delta house was decorated with beautiful Christmas lights, three Christmas trees, and cut out snowflakes in the hallways and rooms of house girls. Jerry, the incredible cook for Tri Deltas, made his famous Mexican hot chocolate, which motivated sisters to brave the cold and study hard for finals. Overall, many chapter members finished the Fall semester with high GPAs and high spirits. The house closed on December 21st as Tri Deltas traveled home for winter break. The Tri Deltas made it back for the Spring semester by January 15th, ready to hit the books and make more fun memories. 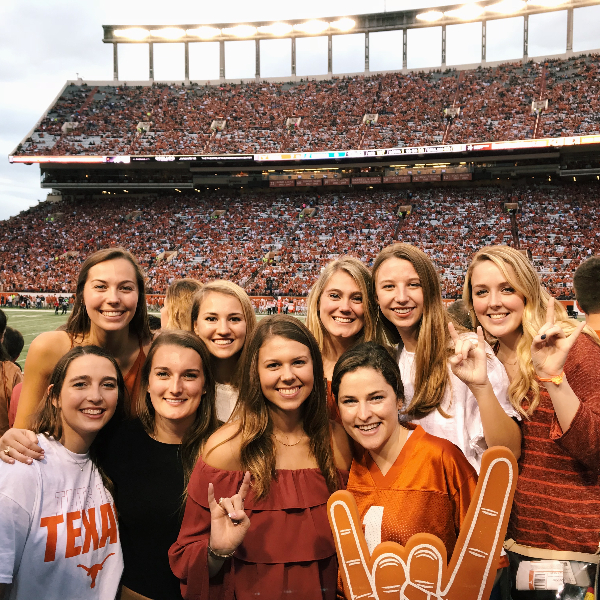 Since fall semester ended and with it the football season, Tri Deltas cheered on the longhorns together at basketball games- watching many overtime wins! Come February 23rd, Tri Delta Moms came to celebrate Mom's Weekend in Austin! 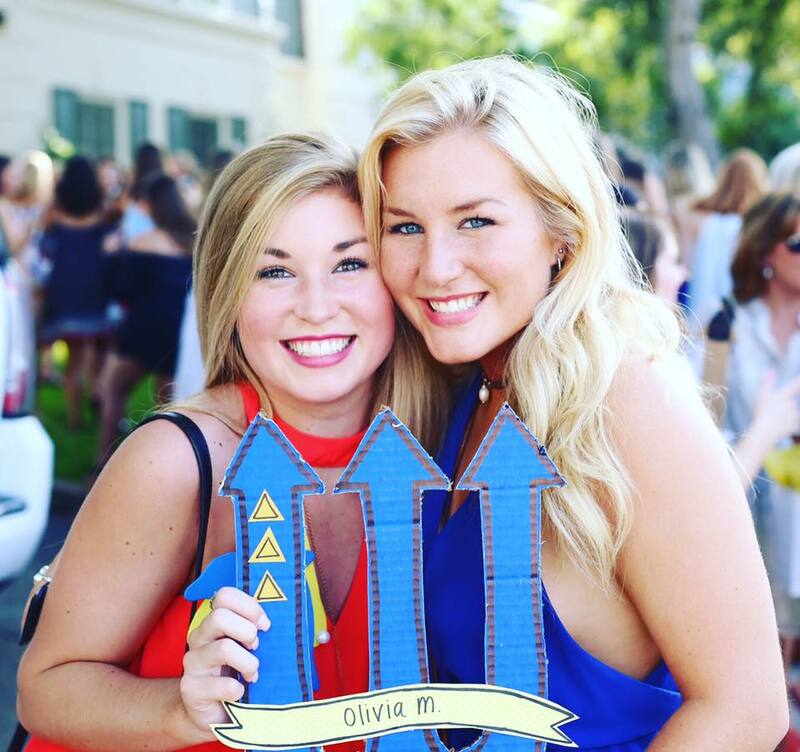 All the Tri Delta sisters got the chance to introduce their moms, and make more memories from past Mom's Weekends. There was a beautiful event on Friday night at Hotel Van Zandt, with lots of chatting, desserts, and a photo booth! The following Saturday consisted of a yummy brunch at the Tri Delta house, where the girls were able to show their moms their new home (away from home, of course). There was even a SoulCycle cycling class that 30 Tri Delts AND their moms attended that Saturday to raise money for St. Jude!! The following Sunday, Tri Delta Moms Club hosted a yoga session for bonding and burning calories! Tri Delta Moms Weekend is always one to remember. After everyone's moms left, the Tri Deltas went back to studying, keeping up with organizations, and social functions. And now, a long awaited Spring Break 2018 has arrived! 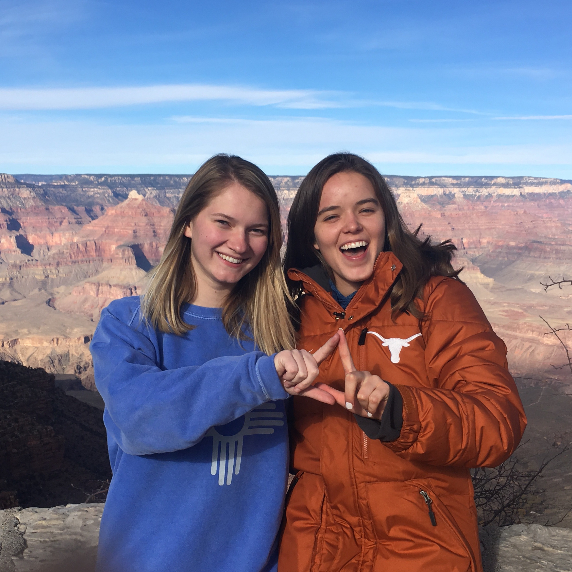 There are Tri Deltas in Colorado, New York, Paris, London, Mexico, Jamaica, and many other cities and countries across the world. 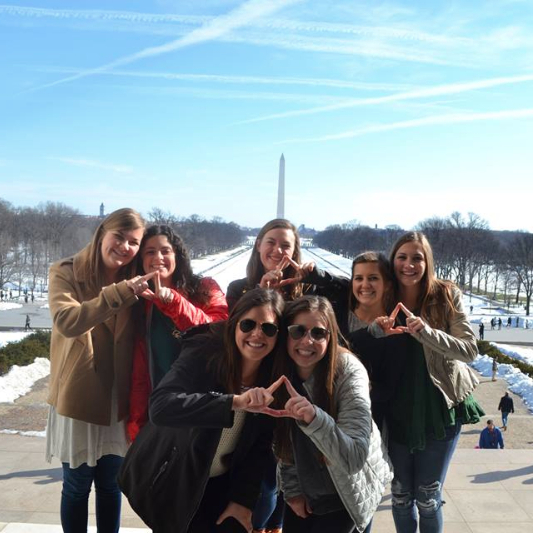 Everyone loves Spring Break- but we also love getting back to our Delta sisters! 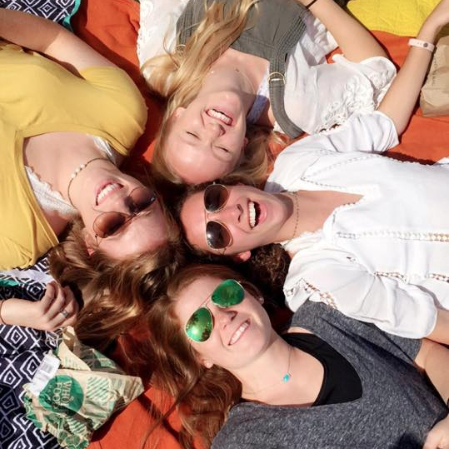 The Tri Deltas jumped back into the school year, ready to finish out the semester strong. All the Theta Zetas hosted the annual Courtyard Cookout in the Tri Delta front yard to raise money for St. Jude! There was a petting zoo, great friends, and the Texas Cowboys grilled hamburgers for everyone. It was a blast, and it was all for the kids at St. Jude Children Research Hospital! Shortly after, it was time for formal and all the Tri Deltas got their dates and had a great time. The weekend after formal brought Dad's weekend, and the Tri Deltas made lots of memories with their dads! There was an event on Friday at Punch Bowl Social, with bowling, games, and karaoke. The next morning, there was yummy barbecue and the Theta Zetas got to show off their beautiful house to their dads. What a blast! From there, the year finished off with a lot of studying for finals. The Tri Delta Mom's Club was so generous in providing lots of study snacks, the girls studied all over the house and throughout campus for weeks! There were 42 4.0 GPAs for the Tri Deltas during the Spring 2018 semester!